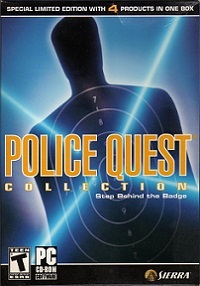 One year has passed since Detective Sonny Bonds successfully brought Jessie Bains to justice in Police Quest 1: In Pursuit of the Death Angel. Bains' world of rampant drugs and open violence has been silenced. As the memory of this animal slowly fades, the city of Lytton once again lives in peace and serenity. But Bains has plans on his own... Using a makeshift knife, he overwhelms a correctional officer and escapes the prison with his hostage. Sonny, who has been promoted to homicide detective, is immediately put into action to find the criminal back. It doesn't take long for Bains to kill the prison guard and dispose his body in the river. At the same time he now has a revolver and stole another car to try and erase his tracks. Fleeing is however not Jessie Bains' only plan - he wants revenge on those who put him in jail. As Sonny follows leads and finds the bodies of murdered key witnesses, he realizes the Death Angel is closing in on him. In addition, Marie, his high school love, gets kidnapped by Bains. Along the tracks, Sonny also has to deal with other criminals, such as a mugger in a park and even terrorists on an airplane! Will Sonny be able to free Marie and take the Death Angel down once and for all, or will he be the next target himself? 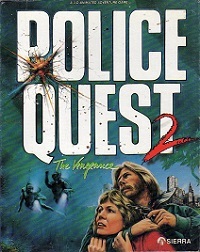 Police Quest 2 was written and directed by retired police officer Jim Walls who once again used real police tactics and procedures to make Police Quest 2 as realistic as possible. The driving sequences of the first game in the series have been removed in this game. Instead Sonny has gotten a chain-smoking partner, Keith, who accompanies him in the car and radios information to the Lytton Police Department. Keith however leaves all the work to Sonny and makes himself very rarely useful. 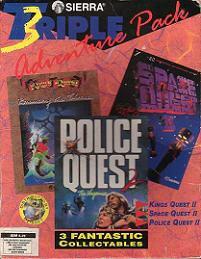 This is the first Police Quest game which uses Sierra's SCI engine. It supports EGA and CGA graphics. 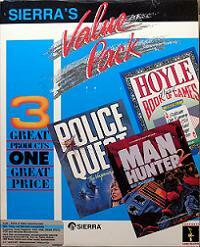 The sound track was composed by Mark Seibert, the first full soundtrack he made for Sierra On-line. Backgrounds and animations were made by Vu Nguyen and Cheryl Cornelius. The game was re-released many times in various collections.